ENJOY THE TEEN/ADULT WORKOUT THAT PACKS A PUNCH!!! With excitement, music and energy. You will see and feel the results of this energy burning workout. Be trained and coached by the best. Click here to Register on line and save! Work at your own speed, modify the workouts to fit your physical challenges and conditioning. Many workout participants have burned over 1,000 calories. Start at any time of the month. 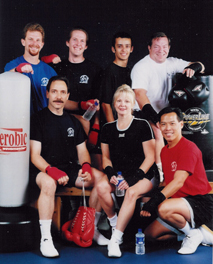 Four Options to start enjoying the power and fitness of Martial Arts Kickboxing.